I am certainly not a “Let’s all join hands and worship the Earth” kind of girl, but I do want to be a good steward of what we have so we can pass on something we are proud of to our kids. One way we try to do this is composting. We started just about the day we arrived in our house. We had a big plastic tub of pretzels (from Sam’s) with a screw lid that we use as our temporary container. I keep this under my kitchen sink. The kids can get to it, put their banana peels, apple cores, or whatever in it – and then they are also the dumpers. So about once a day they take it back to the compost to dump it. peels, and anything else we can that is organic and will break down. Sometimes it is a toss up who gets some old greens – the chickens or the compost? Both are good, so it varies! We started with our compost as a pile in the back yard – no container, just a pile. But as time went on we acquired 3 pallets and now we have a container of sorts. We do need to add another stall or 2 with some more pallets in the near future, but for now, this is working. 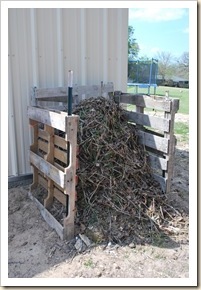 We also add all yard waste : leaves, pine needles, grass clippings, weeds that were pulled, etc. (ashes are great too from the fireplace) You can add newspaper if you have those on hand, we do not really have that much anymore. Each of these items has different ingredients that your garden loves. So a great compost really improves the growth of your plants and vegetables. If you do not garden (vegetable type) you can still compost all this stuff and use it for a flower bed, or to start a garden! It is easy, cheap, good for the planet and can be great for your supper table!! This is what works in our home these days – we hope to implement some more “green” things as we go along!